I love beautifully wrapped presents as much as the next person, but I’ve had kids and pets long enough to know that bows will not last a week in my house. By Christmas Day, I’m lucky if I even have one bow left on a present. Recently, I came across this idea on Pinterest. 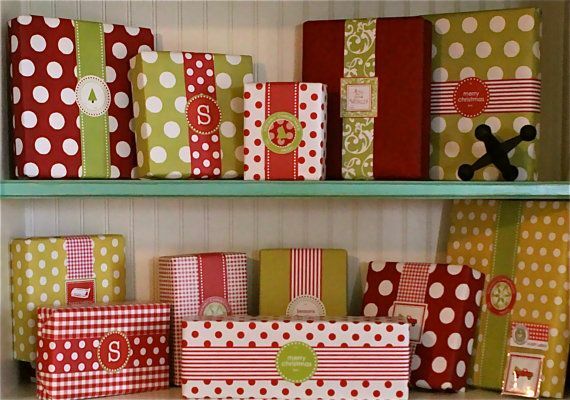 You can buy the wrapping paper, ribbon and labels at this Etsy store. But, I decided to try this using store bought tags and ribbon. One day I’ll be crafty enough to make my own, but not this Christmas. Here is my version. You could definitely make this prettier with nicer wrapping paper and tags, but I let the kids pick out their own paper. I just asked that it have blue or silver this year to match the tree. I love that I can stack the presents on top of each other now without having to worry about the bows getting crushed. Why didn’t I think of this before?! Now, if I could just figure out how to keep the presents wrapped since prying little hands are undoing the edges of the paper. I think the 'no bow" looks better than bows any day! I like this no bow look. It's neat and different. I must pop over to the Etsy store. Pretty! I like bows but I like this look too and one less thing to have to do and fuss about. Mine always get crushed up anyways, these would stay neat. Hope your holidays are going well!